Initially designed in 1911 to haul coal traffic on the Great Central Railway (GCR) to the new docks at Immingham, the GCR 8K would become one of the most successful British steam locomotive designs of the 20th Century. Robinson is also on record with the opinion that the 8K was his best design. The 8K would be adopted by the Government for military purposes during World War One, and used overseas during World War Two. As the 04, it would become the most numerous of LNER heavy goods locomotives. The LNER examples would experience many rebuildings and reboilerings, but many survived in their original form until British Rail (BR) withdrew them in the 1960s. The GCR's new port at Immingham was due to open in 1912, and new mineral locomotives were required to haul the expected increase in coal traffic. In August 1910, an order was placed for twenty locomotives based on Robinson's existing Q4 0-8-0 but enlarged to give greater haulage capacity. The Q4 had already proven itself as a successful design that was robust and simple. The first 8K (No. 966) was built in September 1911. A superheated boiler was fitted of similar size to that used by Robinson on his C4 Atlantics. A leading pony truck was fitted to take the extra weight. The larger boiler was matched with an increase in cylinder diameter from 19in to 21in. The slide valves were replaced with piston valves of 10in diameter, positioned between the frames. As well as inheriting various design elements, the O4s also inherited the nickname 'Tinies' from the Q4s. The O4's boiler was of the same type as used on B5 No. 5184, the C4s, C5s, and S1s. Designed for 200psi, it was actually operated at 180psi. The boiler was fitted with a Belpaire firebox. No. 966 was built with Robinson's new 18 element superheater, introduced a few months earlier on an A5 4-6-2T. This superheater was based on the Schmidt design and was fitted to eight further O4s. Nine of the early O4s were also built with Schmidt superheaters, and four with a 24 element version of the Robinson superheater. This latter 24 element superheater became the standard for new O4s, although in 1916 it was decided to use 22 elements. Often 24 element superheaters were converted by merely blanking off two elements, although some waited until a boiler replacement was required. The 18 element and Schmidt superheaters were all replaced by Grouping. During World War 1, the 8K was developed into the Class 8M (LNER O5) by fitting a larger 5ft 6in boiler. This boiler was actually a shortened version of the boiler used on the B2 'Sir Sam Fay' class with a 28 element superheater fitted. Two batches of ten were ordered, although these did not enter traffic until 1918 and 1921 respectively. Only nineteen 8Ms were built, with one of the first batch being built as the prototype 4-6-0 Class B6 (GCR Class 8N). 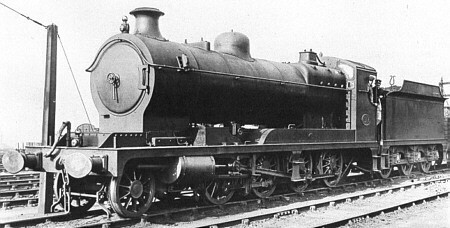 Class 8M was not continued any further, and two of the 8M locomotives were rebuilt as 8Ks in 1922. With World War 1, the Royal Engineers formed its Railway Operating Division ('ROD') which commenced operations in Continental Europe in February 1916. The ROD originally intended to use French and Belgian locomotives, but both of these countries deliberately kept their locomotives away from the Front. British locomotives were quickly conscripted, and early loans included a variety of engines from Britain's railways. It was quickly decided that standardisation was needed, and the ROD chose the GCR's 8K design. Orders for 325 locomotives were placed in February 1917. These orders were followed by orders for 196 more in 1918 in order to keep British industry going during the post-war run-down in military manufacturing. Post-war, the redundant 8Ks were loaned to many of Britain's railways. The GCR even expressed an interest in purchasing some, but the price proved too high. At Grouping in 1923, the LNER inherited 131 8K (LNER O4) and 17 8M (LNER O5) locomotives from the GCR. The ROD's asking price for war-surplus locomotives had dropped, and the LNER was quick to add to its O4 fleet. 125 were purchased in December 1923, followed by 48 in February 1925, and a final purchase of 100 in February 1927. The prices continued to drop, and the last purchase was for the amazingly low price of £340 per locomotive. The remaining ROD-owned locomotives were sold to the GWR, LMS, Australia, and China. The ex-ROD locomotives were generally in good condition, but were fitted with steel inner fireboxes that proved to have short lives. By 1929, the LNER's stock of O4s totalled 405, including a further O5 that had been rebuilt as an O4 (leaving 15 remaining). The O5s were slowly rebuilt as O4s during the 1930s, with the last rebuild occurring in 1943. These were classified as O4/6. The O4s were originally built with Robinson's standard 1ft 10.25in high chimney. In June 1923, No. 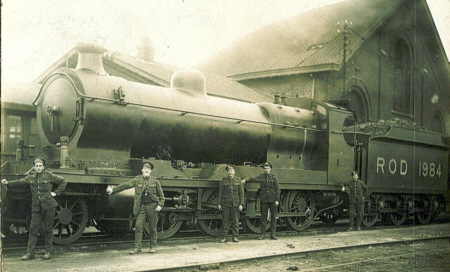 1185 was fitted with a B7-type 1ft 3in chimney for trials in Scotland. Ten ex-ROD locomotives also had these chimneys fitted in 1924 for use in Scotland. The original Robinson chimneys had a tendency to crack, and they were gradually replaced from October 1923 with Doncaster "flowerpot" chimneys. From 1933, reduced-height domes and Gorton plain waisted 1ft 5.5in chimneys were fitted to the remaining unrebuilt O4s to bring them within the LNER's Composite Gauge. Thompson became the LNER's CME in 1941, and he quickly initiated his standardisation programme. 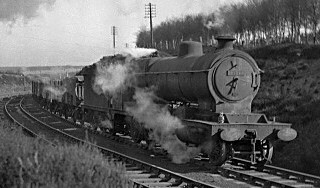 This programme included a 2-8-0 mineral locomotive to replace the existing 2-8-0s, J19s, J20s, and J38s. Wartime austerity measures meant existing locomotives had to be rebuilt, so Thompson chose the O4 as a basis of his rebuilds. The existing frames and wheels were kept, but new Walschaerts valve gear, new cab and a raised running plate were fitted. 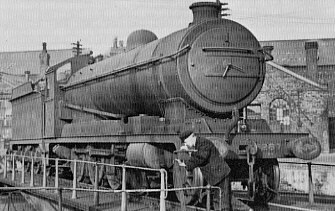 The boiler and cylinders from the B1 4-6-0 were used. The new locomotives were classified as O1 and a total of 58 O4s would be rebuilt between 1944 and 1949. Thompson also rebuilt some of the O4s, fitting the new cab and B1 boiler, but keeping the original valve gear and cylinders. These rebuilds were reclassified O4/8. A total of 99 O4/8s were built between 1944 and 1958. O4/1 1923 126 Ex-GCR; 4000 gallon tender with scoop and vacuum brake. O4/2 1923 3 As O4/1, but with 3,250 gallon tender. 4000 gallon tenders fitted by 1925. O4/2 1925 17 Cut down to NBR loading gauge. Transferred to O4/1 in Dec. 1946. O4/3 1927 273 Ex-ROD; No tender scoop; Steam brake only. Transferred to O4/1 in Dec. 1940. O4/4 1929 2 Rebuilds with O2 boilers. Lengthened frames, new cab. O4/5 1932 9 Rebuilds with shortened O2 boilers. Original cab. O4/6 1938 17 Rebuild from O5. Widened cab retained. O4/7 1939 41 Rebuilds with shortened O2 boilers & fireboxes. Original cab. O4/8 1944 99 B1-type boiler; new cab. The LNER's large purchases of ROD locomotives, meant the O4s fulfilled virtually all of the LNER's heavy mineral locomotive requirements until Nationalisation (1948). The bulk of the O4s were located to the Southern Area (381 total), with small allocations to the North Eastern Area (24) and Scottish Area (16). Allocations tended to be to a greater range of sheds during World War 2. With the outbreak of World War 2, it was expected that the British Army would require O4s, and the LNER started to prepare 300 for requisition. 57 were prepared before the initial order was cancelled. All 57 returned to LNER service. In 1940, the GWR borrowed 30 O4s from the LNER. These returned between 1941 and 1943. In 1941, the military requisitioned 92 O4s (and 50 LMS 8Fs) for service in the Middle East. These opened up a supply route through Persia to Russia. None returned to Britain, and were written off the LNER's books in December 1943. The final sale price of £5,700 to the British Government was finalised in 1947. This compared very favourably with their original purchase prices from the ROD! The British Government purchased five more LNER O4s from British Railways in 1952 for use at Suez. These O4s eventually passed to the Egyptian State Railways. 278 O4s and 51 O1 rebuilds survived into British Railways ownership (1948). The GWR also handed 45 RODs into British Railways ownership. Between 1948 and 1949, seven O4s would be rebuilt as O1. The O4s survived in good strength into British Railways, and many were kept for colliery trip work in South Yorkshire. Withdrawals started in December 1958 and progressed at a steady rate, although they continued to perform good solid work during the 1960s. The last O4 with an original Belpaire boiler design was withdrawn in February 1966. The class finally disappeared from service in April 1966 when four O4/8s were withdrawn. The following details describe the O4s and O5s when they entered LNER ownership in 1923. The first O4, No. 966 had a slightly different specification and is listed separately. Due to the variety of superheaters that were fitted, the boiler specifications are listed in a second table. The quoted engine weight is for the engine only, due to the variety of tenders that were fitted. Cylinders (x2): 21x26in. 21x26in. 21x26in. Heating Surface: Total: 1809 sq.ft. 1745 sq.ft. 1879 sq.ft. 2123 sq.ft. 2336.5 sq.ft. Firebox: 154 sq.ft. 154 sq.ft. 162 sq.ft. 174 sq.ft. 174.5 sq.ft. Grate Area: 26.24 sq.ft. 26.24 sq.ft. 21.53 sq.ft. 26.24 sq.ft. 26.24 sq.ft. No. 5102 (BR No. 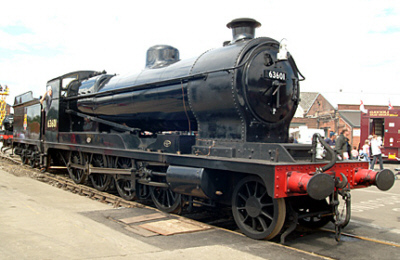 63601) has survived into preservation and is a part of the National Collection. No. 5102 has been restored to running condition and is on permanent loan to the Great Central Railway but is a regular visitor to other preserved railways. Thirteen RODs were purchased by the mining firm of J&A Brown in New South Wales, from the War Department during the 1920s. Three of these are believed to still exist. Nos 20 & 24 (ROD Nos. 1984 & 2003) are currently owned by the Dorrigo Steam Railway and Museum Limited, and will be a part of a new world-class railway museum. The photograph to the right is of No. 1984 during military service. It was built in 1918 by the North British Locomotive Company, and was loaned to the Lancashire & Yorkshire Railway and London North Western Railway during the period November 1919 to August 1921, before being sold to J&A Brown in 1925. J&A Brown operated the Richmond Vale Railway from a connection with the New South Wales Government Railways at Hexham, to the Pelaw Main and Richmond Main collieries. No. 1984 is believed to have been last steamed in 1967 when the network was cut back. The third survivor, No.23 (sometimes known as No. 21), was initially located at Freeman's Waterhole in New South Wales, as a part of a mining display. It has since been relocated to Richmond Vale Railway Museum, and is believed to be undergoing a lengthy restoration process as funds permit. Foxhunter sell a kit of the O4 'ROD' for N Gauge. 3SMR produce a 3mm scale white metal kit of the O4. Bachmann have announded a OO gauge ready to run model of the O4. Little Engines, Proscale, Nu-Cast, and Falcon Brassworks all sell 4mm scale (OO gauge) kist of the O4. Ks Loco Kits have also produced a kit of the O4 for OO gauge, but current availability is unknown. Gladiator sell kits of the O4 and O4/7 for 7mm scale (O gauge). The definitive work on the J&A Brown and the war suplus ROD locomotives that it employed is "Coal Railways and Mines" by Brian Robert Andrews, 2004 (ISBN 0-909650-63-2). This is available from the Australian Railway Historical Society. Thank you to Geoff Byman FRPS for the photograph of O4 No. 63601 at the Doncaster 150 celebrations. Thank you to the Mike Morant Collection for the photograph of O4/3 No. 63883 near Clipstone Colliery. Thank you to the P.H. Groom collection for permission to use the above photographs of O4/7 BR No. 63616 and O4/8 BR No. 63734. Thank you to Malcolm Peirson for the photograph of O4/1 GCR No. 1206. Thank you to Lynn Jackson for the photograph of ROD No. 1984 whilst in military service. Thank you to Owen Brison for information about the J&A Brown operations in New South Wales.